Just when I thougt I was out of the sugar zone these darned things arrived last week. I had completely forgotten that I had ordered them and certainly wasn't expecting them to arrive so soon after the new year. 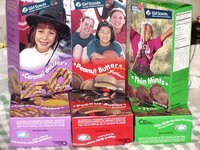 What is it about Girl Scout Cookies? They're not the best cookies I have ever tasted, but once I open a box it is almost impossible to stop eating them. I should give them away, but every time I think about it I just can't do it. So I'm going to try restraint. Ha! Actually, I have done pretty well with them. They came home with me Friday. I opened the Caramel Delites (nothing lite about these though) and only had two. Last night I opened the Peanut Butter Patties. I might have been able to just have two but I had already eaten a slice of pizza and Coney Fries (french fries, chili, onions and mustard - YUM!) at the Avenue Bar after seeing The Painted Veil, which was a beautiful film. The coney fries are the kind of thing that you look at and you can just see how bad it will be for you, but you just can't stop from reaching out and taking just one, so you can see what it tastes like. Then before you know it you're shoveling them into your mouth as fast as you can, almost snarling if someone gets too close to the one you were just going to grab. So I had more than just 2 of the peanut butter patties last night. And I had some more caramel delites too. But (at this point I'll take anything) - I still have some of each left in the first boxes. 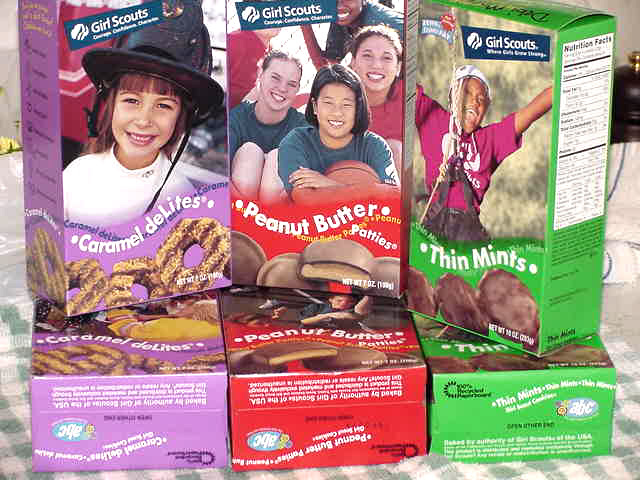 I don't dare open the Thin Mints because I know they'll pretty much disappear immediately. I need to throw them in the freezer. Good thing I've started my freezer project so I can make some room for them. I already had some Boca Burgers, but I don't really count that as part of the project because I didn't have to do anything with them other than throw them in the microwave and eat them. But I have been busy cooking this weekend and have made some progress. But the four-hour season premiere of 24 starts tonight, so I won't be doing any more writing tonight. I was so mad at the last season that I wasn't gong to watch it anymore, but here it is and there you have it. I couldn't believe how good the mustard was on the coney fries, that kind of made the whole thing work.